The Penang State Chinese New Year lantern festival featuring 38 unique lanterns. Catch the annual lighting display at the Kek Lok Si Temple where it showcases more than 10,000 lights and lanterns during Chinese New Year. Chinese New Year is celebrated on the first day of the lunar calendar with each year ushering in a zodiac animal ruling sign. 2017 is the year of the Rooster. Celebrate Chinese New Year with Penang's Chief Minister, YAB Tuan Lim Guan Eng on the first day of Chinese New Year. Penang welcomes the year of Rooster with a showcase of Chinese culture and traditions. The Penang Hokkien Clan celebrates the 9th day of Chinese New Year, also known as Ti Kong She (Jade Emperor God's Birthday) on a grand scale at Chew Jetty on Weld Quay. Float above in Penang on a hot air balloon this 4 and 5 February 2017. 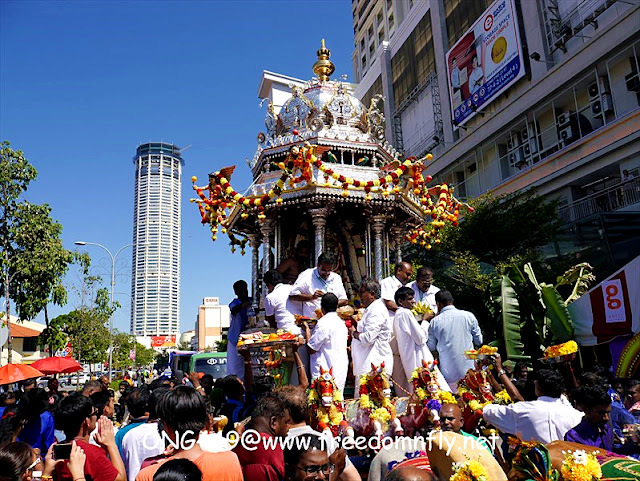 Thaipusam is celebrated during the full moon of the 10th month in the Hindu calendar and is normally held during the last week of January or the beginning of February for a few days. Join the Penang Chap Goh Meh Celebration and see young ladies of marrying age venture out to popular sea promenades to throw oranges into the sea, wishing for a good soul mate. An ideal platform for exhibitors and trade clients across regions of Southeast Asia, West Asia & Europe to promote a wide array of halal consumable and non-consumable products.